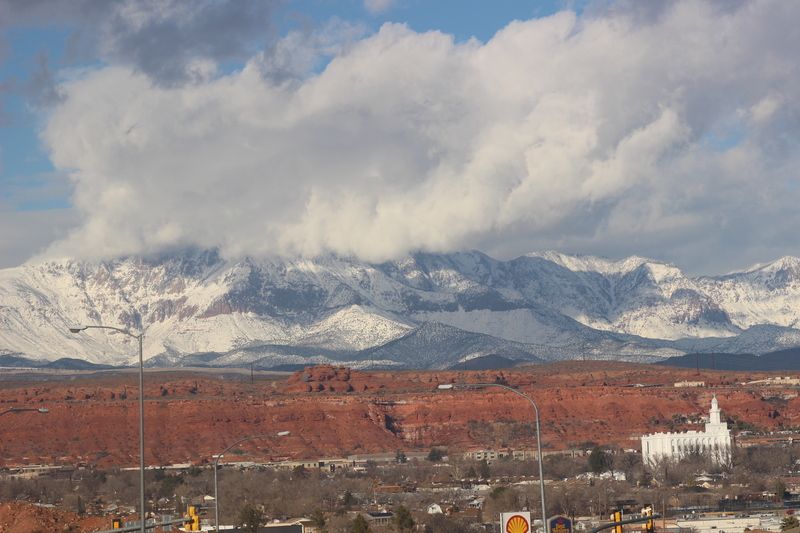 ST. GEORGE – Water officials in the state’s southwestern corner are seeing more snowpack in the mountains than they have in previous, drier years and they’re hopeful the trend continues. “Today we say this looks better than it has for five or six years,” said Ron Thompson, general manager of the Washington County Water Conservancy District. Generally the county’s best months for snow are February and March. Storms at the beginning of the year and since have left mountaintops with snowpacks of 200 to 400 percent above average. If more snow falls in the coming months and doesn’t melt away too quickly, it will put the county in good shape for the coming year, Thompson said. “We think this year we’ll fill up our big reservoirs,” he said. Currently, Sand Hollow and Quail Creek reservoirs are at 81.8 and 77 percent capacity, followed by Kolob at 70 percent and Gunlock at 38.5 percent, according to the water district. Still, a month or two of good snowfall doesn’t wipe away multiple years of drought, Thompson said. “It really takes two to three years to pull out of that,” he said. The increased snowpack doesn’t come without some concern, however. Should rains come through and cause the snowpack to melt faster than hoped, it could trigger flooding. “We’ve had a couple of fair-sized floods come down the Virgin River,” Thompson said. Some of that flooding hit the water district’s Quail Creek diversion dam Jan. 9. The district posted a video to its Facebook page of the water overflowing and moving around the dam. While water levels on the Virgin River have risen somewhat, flooding like that which occurred in 2005 and 2010 isn’t something the county needs to worry about for now, Thompson said. Snow will start running off the mountains naturally in about four to five weeks, he said. With the winter moisture, Thompson also wants to remind people to hold off on outdoor watering and irrigation. There generally isn’t a need to water much between mid-November and March, he said. “We’re just wasting water when we are watering this time of year,” Thompson said. Oh this is good news because it means that we will have enough water so we can water our lawns while it’s raining LOL ! He’s back! The king of all comedy himself. How does he do it? Where does he get his golden material? We are all in the presence of greatness. Where does he get his material? Why from everyone else, that’s who! I know you are, but what am I? POW! Comedy gold. This is great news, I checkethe weather channel last August, and asked about winter weather in southwest.. They said warmer than usual and more moisture.. So now we are getting what they predicted… The comment previous was correct.. The worst offenders are public parks and golf courses. Where’s have seen sprinklers on when it’s raining..